From the archives. Originally published September 7, 2014. Most employers have. E-Verify is a free verification system under the umbrella of the Department of Homeland Security. Registered employers can use this system to make sure that job applicants are eligible for employment. Interestingly enough, our own President doesn’t pass muster. As it would turn out, Barack Obama has been given the job of “leader of the free world,” but is not eligible to be a fry cook at your local Burger King. The man couldn’t even get a job sweeping the floors at the White House yet he is living there. This is a media and government cover up. It goes way beyond what you might think. Big right wing news sources have been accused of their complicity in the matter as well. I will show you documents that leave little doubt to my claims, but ultimately it probably won’t matter. This is the biggest fraud in American history and no one in congress seems to care, courts won’t even hear the case, and the citizens are more worried about how many TD passes their fantasy QB has today than the fact that a usurper is in office. Nevertheless, I present the truth. Barack Obama was caught using a social security number that was clearly not issued to him, as far back as 2010. He has used it on numerous occasions but there have been aggressive attempts to get rid of the evidence. It is hard to find these images using search engines. Try for yourself. This is from a 2009 tax return. Even though there is a line through the social security number, it is pretty easy to make out as 042-68-4425. Some say this number was assigned to a man that was born in 1890. Who it may belong to is not important. The important fact is that Barack Obama has used, on numerous occasions, a social security number that is very likely not rightfully his. Why Barack Obama’s Social Security card application might have included a Connecticut mailing address is something of a curiosity, as he had no known connection to that state at the time, but by itself that quirk is no indicator of fraud. Maybe it is not 100% proof of fraud but can they at least admit it is reason enough to investigate? I was born in Kansas and my SSN starts with 512. 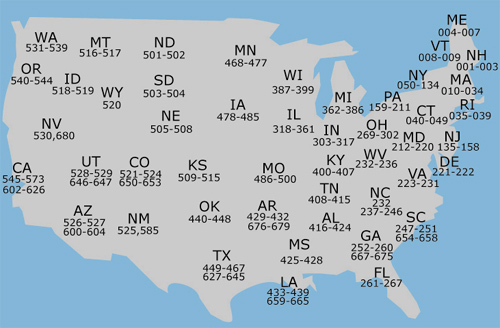 There may be exceptions but it is highly unlikely that a man born in, and living in, Hawaii would be assigned an “042” number. 1. Costco knows Obama’s Connecticut-issued Social Security number is fraudulent but supports him anyway. I ran Obama’s name, the SSN he uses, 042-68-4425 and the birth date heclaims, through an E-Verify check and it came back flagged with a Special Indicator Code (SIC) for fraud . . . special indicator #8 which identifies an SSN that was determined to have been assigned based on fraudulent documents or no documents and is only given after an Office of Inspector General (OIG) investigation. We know Obama put that number on his forged Selective Service registration in 2008, we know he used it when he filed his tax return in 2010, and we know that as of March 2012, long after I ran the E-Verify check, he was still using it. We also know that this SSN was not issued to Barack Obama. It was issued to someone with a Connecticut address in March 1977. Where was Obama in March 1977? He was a fifteen year old attending high school in Hawaii! He never lived in Connecticut or traveled to Connecticut as a teenager. What document do you have to provide to the SSA to prove citizenship when applying for a SSN? A birth certificate. Someone who uses a stolen SSN, one that he obtained without providing any documentation of age or citizenship, does so because they don’t have a birth certificate that would prove they are a U.S. citizen. They don’t have a birth certificate that would qualify them for a SSN. They plain don’t have one or the one they have identifies them as a citizen of another country. Costco employs over 140,000 people and yet the person they advocated to occupy the highest office in the land, Barack Obama, failed E-Verify. Costco demands that their employees prove their citizenship and/or eligibility status but fails to hold their man in the White House to the same standard. Note: The Costco employee is not the first to discover that Obama fails E-Verify. 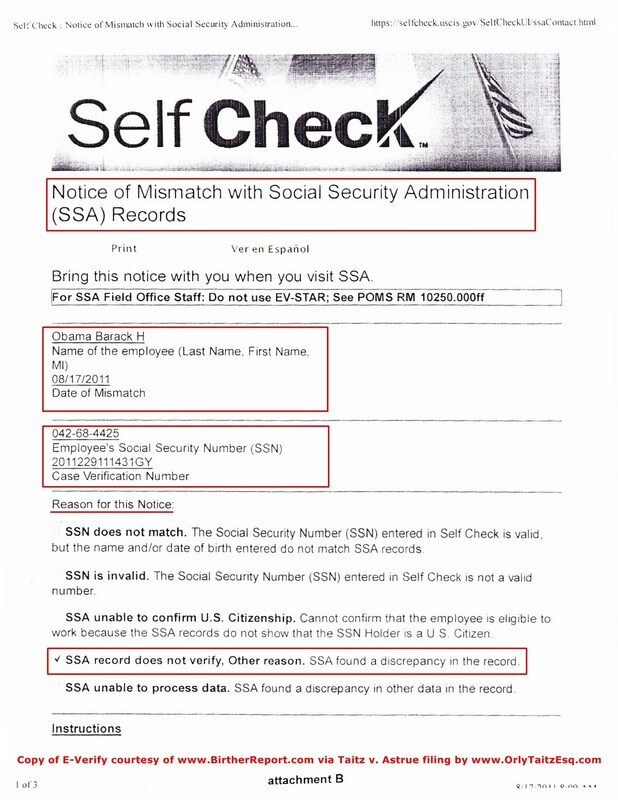 In 2011, a researcher in Seattle, Washington named Linda Jordan ran the SSN Barack Obama had used on his 2010 tax return through E-Verify and discovered that the SSN had been flagged with a Special Indicator Code for fraud. It was not Obama’s SSN. Since then she has continued to work to expose Obama’s use of forged identity documents that he used to get on the ballot and in to the White House. She is the owner of We The People T.V. at obamasfakeid.com. There you have it. Barack Obama is President of the United States but is not eligible to spray the lots at your local McDonald’s or collect carts at your local Walmart. Below is an image of an official e-verify report run on Barack Hussein Obama’s fraudulent social security number. So how does one simply go from being ineligible to flip burgers to arguably being the most powerful man in the world? The truth is that all large media sources and both “parties” in congress are complicit. There is no longer regard for law in America. There aren’t enough good guys to overcome those who are hiding these things from America. Those who will speak up are simply disregarded as crazy conspiracy theorists, even when their stories are backed with solid evidence. We are being set up for a fall and that’s a fact. Be ready because it is coming.